As you might guess by the name Surfers Paradise, the Gold Coast features some fantastic surf breaks. If you’re in the area and keen to bring out the board, here’s our quick overview of the best Gold Coast beaches for surfing. 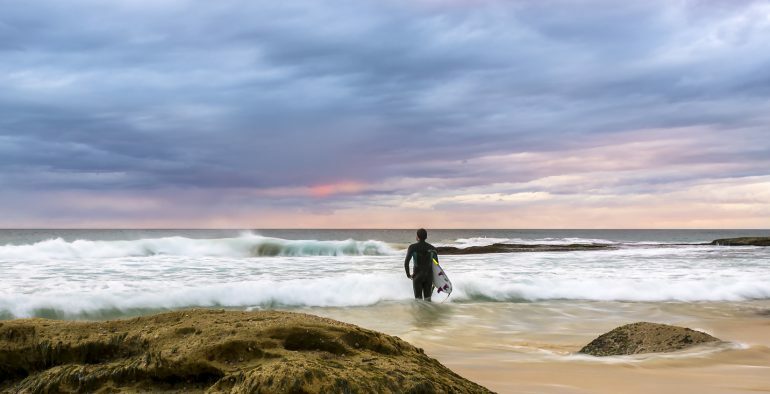 The most famous surfing beach of all on the Gold Coast is obviously Surfers, and it could be the best beach on the Gold Coast for surfers of all levels. You may need to work your way through the tourists to find a spot, but beyond the throng there is usually a reliable break with left and right waves that are ideal for beginners when the surf is small. There’s an artificial reef built at Narrowneck which provides a great ride when the surf is up. This area is not recommended for beginner surfers at maximum surf as the reef can be somewhat tricky to navigate, although when the water is calm you’ll find it’s an ideal spot for stand-up paddle boarding. There’s a reason that the Quiksilver Pro Surfing Competition is held at the infamous Snapper Rocks. On a good day there’s a right-hand point break that can start from here and carry you for hundreds of metres. It’s a popular spot, so be sure to keep out of the way of the many semi-pro and pro surfers who call this break home! Technically following on from Snapper Rocks, Greenmount often features beautiful long waves that can be beginner-friendly when the surf is small and provides a popular pro hangout when big, which will typically be with a southern swell. It may also be the best Gold Coast beach for spotting a famous surfing face or two. Currumbin Alley is loved by surfers of all experience. For the beginners, there’s a whitewash wave that’s protected from the southerly winds. For more advanced surfers, you’ll find a right-hand point break that wraps around the point and brings you in towards and past the creek. Expect a decent paddle in return for long rides when the surf is right! Looking to stay in town? Reserve your luxury apartments on the Gold Coast and enjoy uninterrupted views over the world-famous surf for the entirety of your stay.